(Cowes, Isle of Wight, England)- Cowes Week is one of the UK's longest running and most successful sporting events and is a key highlight of the British sporting summer. It has been held in early August every year since 1826, except during the two world wars. Traditionally, Cowes Week takes place after Glorious Goodwood and before the Glorious Twelfth (the first day of the grouse shooting season)- occasionally the traditional dates are changed to ensure optimum racing, taking account of the tides, of course. Over the years, the event has attracted British and foreign royalty, and many famous faces. The event offers a great mix of competitive sailing and social activities. The 8,500 competitors range from Olympic and World-Class professionals to weekend sailors. In excess of 100,000 spectators come to watch the sailing, enjoy the parties and live entertainment, and to experience the unique atmosphere. It is genuinely a one-of-a-kind event. 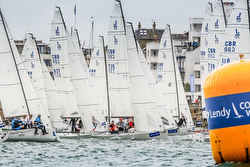 The 2018 edition of the annual LENDY Cowes Week Regatta will take place from August 4th to 11th on the amazingly challenging and capricious Solent. It has been extremely popular for J/Teams across not only the United Kingdom and Ireland, but across Europe as well. The largest J/fleet will again be the J/70 class, with thirty-eight entries sailing the four-day short series. Virtually all the top U.K. teams are in attendance, since it marks a critical part of the UK J/70 National Series. Those teams include Terence O’Neill’s AQUA J, Paul Wards’ EAT SLEEP J REPEAT, Martin Dent’s JELVIS, Simon Cavey’s JUST4PLAY, Peter Harrison’s SORCHA J, Tony Hanlon’s SPITFIRE, and Jack Davies’ YETI. The nine-boat J/80 class has a cast of new characters in their midst, such as Mike Lewis’ JESTER, Fiona & Malcolm Thorpe’s KING LOUIE, Chris Body’s MOCKINGJAY, and Richard Powell’s PURPLE HAZE. Amongst the eighteen entries for the J/109 class are a number of familiar faces that have been near the top of the class leaderboard over time, such as Roger Phillips’ DESIGNSTAR, Simon Perry’s JIRAFFE, John Smart’s JUKEBOX, Chris Sharples & Rick Acland’s JUMPING JELLYFISH, Chris Burleigh’s JYBE TALKIN’, and Nick Southward/ John Scott/ Andrew Christie’s Hong Kong-based crew on TEAM WHISKEY JACK. The IRC 2 Class of twenty-three entries has three J/111s (Tony Mack’s McFLY, Chris Jones & Louise Makin’s JOURNEYMAKER II, & Simon Bamford’s KESTREL), three J/122s (Tony Coleman’s JOLLY JELLYFISH, Marc Vercruysee’s Belgian ZUMEX, & Chris Daniel’s JUNO), and Christian Reynold’s J/120 PERFORMANCE YACHT RACING SUNSET. With two-dozen entries, the IRC 4 Class has a few lethal weapons of the 35-foot-plus J/Boats variety. Three J/112E’s will be doing battle, including past class winner Chaz Ivill’s DAVANTI TYRES, David Franks’ LEON, and Peter Symons’ J’OUVERT. In addition, three J/105s will also be on the line, such as Ross Farrow’s JACANA, Prof. Roger Williams’ JOS OF HAMBLE, ad Emre Derman’s RED EYE. Finally, there is Jonty & Vickey Layfield’s J/11S SLEEPER XI and Jules Hall & Nick Elderfield’s J/35 BENGAL MAGIC DISKO TROOPER. IRC 5 Class has twenty-five entries, including four J/92’s (Alan Macleod & Andy Knowles’ SAMURAI J, David Greenhalgh’s J’RONIMO, Banks Overstall & Searle’s NIGHTJAR, & Mark Waddington’s VAGABOND); four J/97s (Andy & Annie Howe’s BLACKJACK II, Rachel Dave & Robert Hunt’s JUMBLESAIL II, Jim Owens’ JET, and Bob & John Baker’s JAYWALKER); Robin Stevenson’s J/92S UPSTART; and Ed Holton’s J/110 SHADES OF BLUE. IRC Doublehanded Class will have two J/105s sailing all week- Natalia Jobling’s MOSTLY HARMLESS an Andy Roberts & Bill Edgerley’s JIN TONIC. 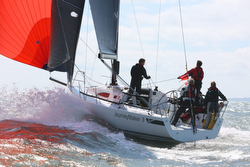 For more Lendy Cowes Week sailing information Add to Flipboard Magazine. J/Teams Win Sandusky Deepwater Race! J/99 Short-handed Offshore Speedster Update! J/Crews Love Whidbey Island “Summer Camp”! J/44 MAXINE Wins NYYC Queen’s Cup!